In our last article, we performed mapped inheritance between the classes to database using Hibernate's default single table strategy. In this article, we are going to show you how to perform inheritance using Hibernate's table per class strategy by using specific annotations. As the name says, table per class strategy allows us to performing inheritance using Hibernate that will create different tables created for each class involved in the inheritance. i.e. a separate table for parent class and a separate table for each of its child classes, with each child class inheriting the properties from the parent class. Let's take the same example of an Entity class - Country, which is extended/inherited by two classes AsianCountry and EurpoeanCountry. Now, let's see how Hibernate performs object-relational-mapping(ORM) to represent the inheritance between these three classes in the database, by using table per class strategy. The strategy element of @Inheritance annotations tells the Hibernate the strategy used to perform inheritance and for now we are going to use the default strategy - InhertanceType.TABLE_PER_CLASS, which will create a separate table for parent class and a separate table for each of its child classes. 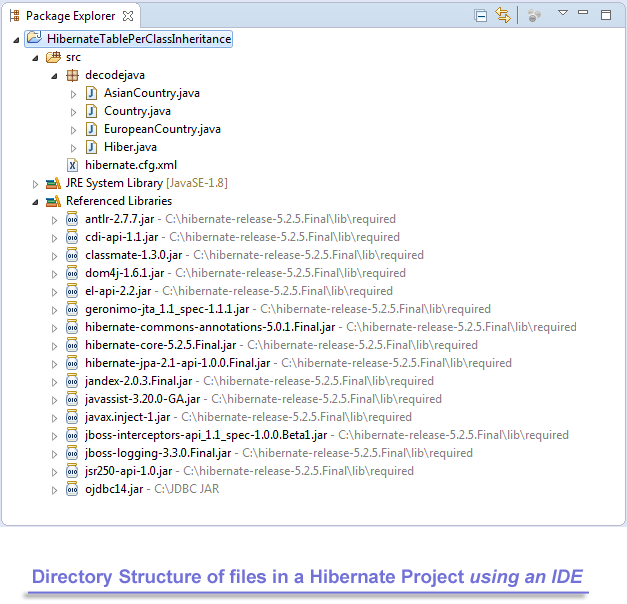 Project Folder - HibernateTablePerClassInheritance is the name of our Project and it is a top-level directory. This output shows you all the SQL commands executed by the Hibernate within the database to map the inheritance between the Java classes to a separate database table for each class and perform all the activities of creating the tables and saving the objects of all three Entity classes. 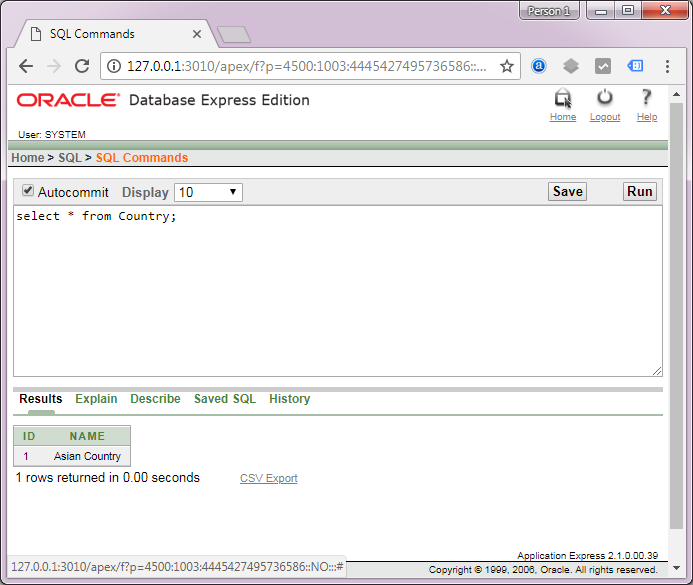 Country, representing object-relational mapping(ORM) for Country class. 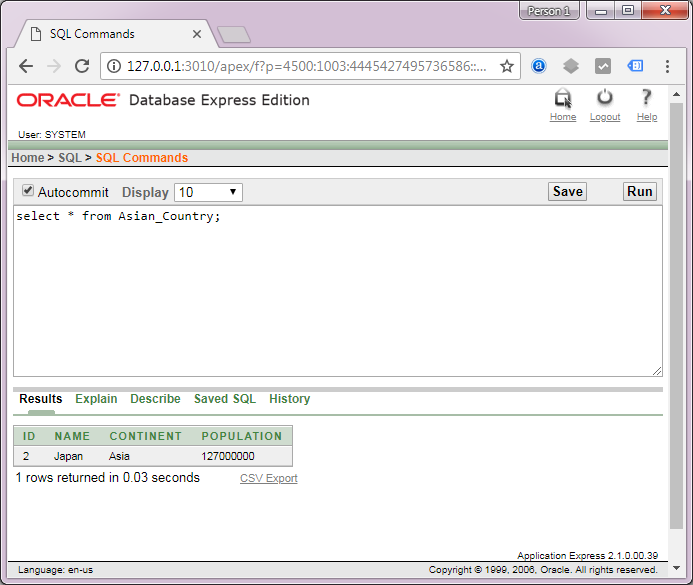 Asian_Country, representing object-relational mapping(ORM) for AsianCountry class. European_Country, representing object-relational mapping(ORM) for EuropeanCountry class. This table shows you the object of parent class Country represented by Country, as shown above. This table shows you the object of child class AsianCountry and the properties such as id and name it has inherited from its parent class Country, as shown above. This table shows you the object of child class EuropeanCountry and the properties such as id and name it has inherited from its parent class Country, as shown above. In the upcoming articles, we are going to look at the third strategy used by Hibernate to implement inheritance between classes, known as - Joined.